Shuttle Endeavour has undocked from the International Space Station (ISS), marking the completion of a highly successful docked phase for STS-130. With Late Inspections also completed by the end of the Flight Day, only another Micro-Meteoroid Orbital Debris (MMOD) strike – this time on Window 2 of the orbiter flight deck – was added as an item of interest, although this has already been cleared for entry. Endeavour’s path towards a Sunday landing will include the checkout of the orbiter’s systems required for landing on Saturday (End Of Mission-1 – EOM-1), following Friday night’s departure from the Station. “STS-130 mission is proceeding nominally. Flight Day 11/12 Activities Completed: Orbiter to ISS transfers. Hatch was closed at 0308 EST this morning. ODS (Orbiter Docking System) leak checks were completed at 0319 EST. Orbiter undocked from ISS today at 1954 hrs EST. Flight Control System checkout and RCS (Reaction Control System) hot fire Saturday evening,” noted NTD mission status. 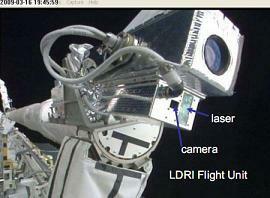 The TCS (Trajectory Control Sensor) was used during undocking, despite the recording of erratic data during rendezvous on Flight Day 3. Via new procedures that were sent to the crew earlier in the week, the TCS performed as planned. “The operation of the STS-130 (20A) Trajectory Control Sensor (TCS), S/N 1007 was nominal and complete by 12:47 AM CST in support of Tools Checkout prior to ISS undocking activities,” noted Mission Management Team (MMT) documentation (L2) ahead of undocking. “The unit was powered ON at approximately 12:23 AM CST. The TCS unit passed all self tests. The unit was allowed to remain powered through two long calibrations for TCS. Engineering to collect and evaluate data. The unit was powered down at approximately 12:47 AM CST. Undocking and flyaround was – as per usual – stunning, with Endeavour taking a 360 degree tour of the Station, whilst allowing for some high resolution photography to be taken of a TPS (Thermal Protection System) anomaly on one of the docked Soyuz spacecrafts. This was requested by Russian engineers, who have only low resolution photography to work with prior to Endeavour’s flyaround. With two retrograde (opposite to the direction of travel) burns completed by Endeavour, the STS-130 crew are fast losing sight of the ISS. However, they will still be able to return, in the highly unlikely event of a serious TPS issue being found during Late Inspections. Those inspections picked up late on Flight Day 13, with all RCC (Reinforced Carbon Carbon) on Endeavour inspected during the OBSS (Orbiter Boom Sensor System) sweep of the Starboard Wing, Nose Cap, and Port Wing. The two wing surveys covered most of the areas of the crew cabin, while the OMS Pods are inspected using a handheld camera to take pictures from the aft flight deck windows. The imagery gained will now be reviewed by the DAT (Damage Assessment Team) on the ground, cross-referencing with the Flight Day 2 and 3 footage, prior to a peer review that will ultimately clear the orbiter for re-entry sometime on Saturday. Two opportunities are available for landing at the Kennedy Space Center (KSC) on Sunday, with Edwards Air Force Base on standby to be called up as back-up. Due to ever-changing weather forecasts, White Sands was even mentioned to the crew as a potential landing site – though this is likely to be a reference to a Monday (EOM+1) call up option. KSC’s first landing opportunity will be Sunday evening at 2216 EST, with a second landing opportunity – if needed – Sunday evening at 2351 EST. The mission has been proceeding extremely well from an orbiter perspective, with no issues of note being worked by the Mission Evaluation Room (MER) in Houston. Only two items were noted via MER and MMT materials ahead of undocking, the first of which relates to the capacity of the orbiter’s waste water tank. “MER Items: EECOM (Emergency, Environmental and Consumables Operation Manager) closely monitoring Shuttle waste tank quantities in hopes of not having to offload the waste tank into CWCs (Contingency Water Container) prior to the post-undocking waste dump opportunity,” added MMT documentation. Endeavour is free to carry out a water dump now she is clear of the ISS. The impact to the flight deck window is the second recorded MMOD strike for Endeavour – but as with the hatch window, the damage is only minor and has been cleared for entry. “Problem Description: The STS-130 crew reported a micro-meteoroid orbit debris (MMOD) impact on Thermal Window 2 (middle window). 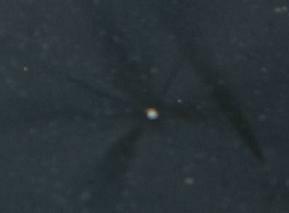 From imagery, the impact appears to be less than 0.10 inch diameter,” noted the MMT presentation on the damage site. “Problem Impact/Significance: The analysis shows a 99.865 percent probability of maintaining +MOS on entry for the Middle Window on defects up to 1.20 inch diameter. Since the defect reported is estimated at < 0.20 inch diameter, there is no increase in risk associated with this defect on entry and recommends nominal EOM. 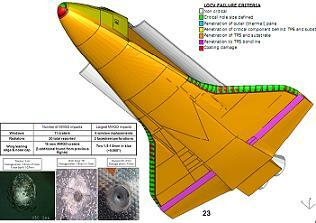 “Most Probable Cause: Micro-meteoroid orbit debris likely created the defect reported on W2 on STS-130. Next Failure Consequence: Cracking of the pane (if thermal pane fails at peak aerodynamic load, well after heating). This is the most likely failure mode. The hatch window and Window 2 strikes are the first recorded MMOD incidents since STS-126. Such MMOD impacts are, however, not uncommon and are rarely a concern based on risk matrix findings – which is created ahead of a mission. STS-125’s trip to service Hubble held the highest level of risk for any of the final flights of the manifest – due to the higher orbit – but Atlantis suffered no incidents of note. Windows are regularly changed out post-flight, as is likely to be the case with Endeavour’s window 2, when she is back in her Orbiter Processing Facility (OPF) for processing towards the STS-134 mission – “currently” her final mission.